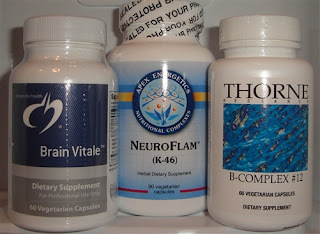 Includes 3 key products proven to be helpful for dogs with seizures: Brain Vitale, NeuroFlam, B Complex #12. For best results, we highly recommend using the Dog Seizure Support Kit in conjunction with Amazing Omegas. For Canine Brain Tumor, Epilepsy and Neurological Support in Pets. Works great to minimize and/or prevent seizures. If your pet has been diagnosed with a brain tumor, brain cancer, epilepsy and/or neurological issues, this product is extremely helpful. It provides important nutrients for the brain and the ingredients have been third party tested for potency. This is one of the most important supplements you can give your pet with any type of brain condition. For canine seizures, canine epilepsy, canine brain disorders, neurological inflammation and nerve-pain, canine brain tumors, muscular nerve pain. Neuroflam provides key nutritional ingredients that have demonstrated benefits during neuroinflammation and microglia activation that typically accompanies neurodegenerative conditions, peripheral neuropathic condtions and brain or nerve injury. It also provides a rich source of antioxidants for brain tissue health. If your dog is suffering from seizures, canine epilepsy, neurological pain (in the limbs for example) or other neurological health concerns, holistic care can help. It is terribly upsetting to watch your dog have a seizure or suffer from neurological problems. We have experience with these brain disorders and have seen improved results. This simple formula is excellent for cats and dogs. It is highly bioavailable making it more effective than general synthetic b-vitamins. B-Complex #12 contains an optimal balance of essential B vitamins with extra vitamin B12 and folate. Vitamin B12 and folate are necessary for normal red blood cell formation, tissue and cellular repair, homocysteine metabolism, and DNA synthesis.